In Poland, the Lemko churches in Berest, Hancova and Polyany exhibit a style similar to those in Slovakia. However, the variation in roof structure which one sees in Slovakia is not as prevalent. The majority exhibit the tripartite plan with descending towers from west to east which are topped with cupolas. One of these occurs in the church of St. Paraskeva in Kwiaton. Its' middle room has three pyramidal structures decreasing in size as they go upward. The roof is capped with a large cupola. Its eastern room has two pyramidal structures topped by a cupola. Kwiaton is the only totally wooden church which I have seen with these features, although the churches in Uscie Gorlickie and Wysowa whose roofs are sheathed in tin possess the same pattern. In most churches, the three cupolas are usually the same size (especially if they are quite large). In Dubne, however, the cupolas found on the central and eastern roofs are larger than the one on the western tower. Most times, it is the other way around with the smaller cupolas located on the eastern roof. Even if three roofs were not built on the church, they still had the three cupolas, whereas in Slovakia only two cupolas are seen on many of the churches. This is especially prevalent in those churches along the eastern border of the country. The church of St. Demetrius in Zlockie has an unusual octagonal dome located atop the central room. Arched windows located on the dome allow light to shine on the iconostasis. Its' interior contains exquisite examples of Lemko artisanship. Non-functional clocks usually surrounded by painted shingles or boards, may also be found on the western towers as ornamentation. The churches in Hancova, Wysowa and the church of the Nativity of the Blessed Virgin Mary from Ropki in the Sanok museum possess this feature. In Slovakia, the only example of a church containing this feature is found in the church from the village of Mikulasova now located in the Bardejovske Kupele. Brykowski has placed the Lemko churches in Poland into five distinct categories. One now sees this classification being posted outside the churches; even publications in Slovakia are using his terminology. Bell towers are as unique as the churches themselves. Unlike the churches, the post and beam method was used in their construction. The wooden bell tower in Yasinya is the only one of its type in Transcarpathia. In Hutsul churches, the bell tower is separate from the church, although most of the Lemko churches have bell towers standing apart from the church. In Slovakia it is unusual to find the bell tower as a separate building from the church. Bells are usually found in the tower located on the western end of the church. Separate bell towers can be found in the villages of Korejovce, Ladomirova and Potoky although, these tended to be built at a much later date than the church itself. In Poland, one sees a contrast between the two countries. In those churches which have bell towers, the building material was either stone or steel. The bells have some type of canopy but for the most part, they are exposed to the elements. An example of one, is the beautiful bell tower from the church in Kožuchovce located in the musuem in Kosice. The most common type of bell tower is the two-storied tower. The walls of the bottom story were usually built in the solid-timber technique and had a gate to gain entrance. The first story of the tower seems to be utilized for storage of church materials used for holidays or funerals one can find plastic flowers and wreaths, candle holders and once in a while a cart for holding the coffin. The bell tower may be topped with a shingled tent like roof topped by a shingled cupola or nowadays, a tin sheathed cupola, or it may be a miniature version of the church roof itself. The second story has the appearance of a gallery. In some bell towers, the gallery is exposed to the elements, in others, it is enclosed. Transcarpathian churches for the most part have preserved their bell towers (which were usually built after the construction of the church), although new masonry bell towers are slowly replacing the wooden ones. They seem so totally out of place for they upset the church symmetry and its connectiveness with the environment. All of the churches have metal crosses on the steeples. Most have a Rus' eight pointed three bar cross. The bottom bar may or may not be slanted (on the Greek Catholic churches, this bar is always straight across, whether the church is located in Lemkovyna, Slovakia, or Zakarpathia). One notices the creativity of Rusyn metalworkers on this basic type, for a variety of symbols can be found on the crosses. The cross' arms may bear smaller crosses or stars or flowers, etc. The arms of the cross may be lilly or clover shaped. On several of the crosses, five smaller crosses are placed around the arms. These signify where Christ was pierced. A symbol for the sun can also be found in the center of the cross or represented in some other fashion. A unique symbol is the inverted crest forged at the bottom of the cross. This symbolizes the victory of Christianity over Islam and the Turks. Crosses with this symbol are found on the churches in Bodružal, Fricka, Jedlinka, Kožechovce, Nova Polianka, Potoky and Tročany in Slovakia; Banica, Berest, Bogusa, Czarna, Hanchova, Yastrebyk, Kun'kova, Mylyk, Novica, Pryslop, Skwirtne and Uscie Gorlicske in Poland. The churches in Transcarpathia for the most part have the three bar cross on the steeple with none of the fancy ornamentations that are found on the churches in Slovakia and Poland. These crosses also serve as lightning rods; they contain cables which run over the roof and down the sides into the ground and help to minimize the chance of fire from lightning. (see photo of church in Mirol'a). Windows are a sparse feature on wooden churches as glass was a rare and valuable commodity. They only played a utilitarian role. The small openings merely served to bring in light. In the Lemko churches, one will notice two windows which function to focus light on the iconostasis. There may or may not be other windows in the building. The Church of St. Nicholas in Kolodne possesses an unusual quatrefoil window in the east apse wall. It contains no glass and probably was derived from Gothic masonry structures. Especially in Transcarpathia, the windows are quite small and high up on the walls. It is impossible to see the inside of the building. The later churches have larger windows and may even have one on the eastern end, but due to their location on the walls, one would need a ladder to look inside the church. However, in Slovakia and Poland, the churches have more windows, even on the eastern end. Since they tend to be located closer to the ground, it is easier to see inside the building. Other features of Rusyn churches include the hand carved doors and archways with their hand forged hinges and locks, hand forged metal bars or grates which cover the windows and wooden racks used for hanging coats which are found on the outside walls; the list is endless. Especially in Transcarpathia, the date of construction of the church was carved on the lintel in Old Slavonic. If the church was reconstructed or any repairs were done, the dates are specified somewhere on the building. We saw several church towers which had the repair date on the tower itself. As one travels throughout Rusyn territory, one sees a pattern so to speak in regards to the architecture of the local wooden church. 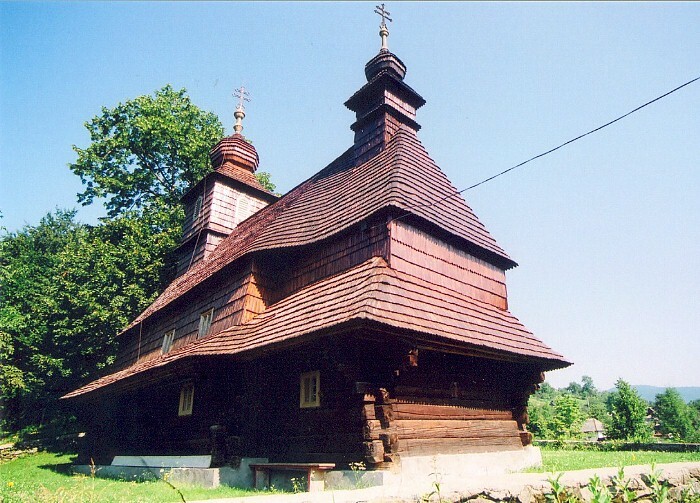 The Hutsul type churches tend to be found among the Hutsuls while the Boyko churches are found in Boyko inhabited villages in Transcarpathia. Gothic style churches are found in the Tysa River Valley, while the Baroque style flourished among the Lemkos. That doesn't imply that you won't see another style in a particular area. It is just that in specific areas, one style tends to dominate. All of the wooden churches in Slovakia have been proclaimed by the government as historical cultural monuments. In the year 2000, the country paid for an extensive renovation of the churches. While many just received a new coat of stain, others were completely restored - interior and exterior. These included Krajne Cierno, Jedlinka, Korejovce and Prikra, while the church in Bodruzal was renovated in 2004. They look like the old churches but the old roof shingles and sheathing have been replaced due to the deterioration of the original logs and wooden shingles. Church interiors were endangered due to leaking roofs. When you go inside these churches you can see the sky through the shingles on the roof, however, the wood swells when the humidity is high and therefore, moisture will not enter the building. In regards to the churches which were totally reconstructed, their shingles had deteriorated due to wood rot and insect damage that water started leaking into the sanctuary. Since their iconostasis' were in danger of major water damage, total replacement was the only solution. The replacement shingles were impregnated by a preserving solution before the were placed on the buildings. Thus the natural color of the wood will be preserved. Visitors will be able to see the actual appearance of these buildings before the dark preservation stains were adopted. If one consults the photographs in Zapletal's book, it is apparent that none of the churches which he photographed after WWI had their wood stained. Several of the churches including Krajne Cierno and Potoky have also had their iconostasis' repaired or renovated. However, there are no words to describe the restoration of the inside of the church in Prikra except unbelievable! Its beauty is beyond words. One has also noticed a change in Lemkovyna in regards to the wooden churches. Even though for the most part, our churches are under the jurisdiction of the Polish Catholic Church, they are being restored to their original grandeur, i.e., before the expulsion of the Lemkos. As a result of the government's recognition of the significance of these wooden churches, they have instituted a program to save the most valuable structures. All across Lemkovyna, renovations may be seen from the tiny villages of Przyslop and Nowica to Bogusa, Andreyivka and Mylyk. The church of St. Demetrius in Bogusa underwent extensive renovations both inside and out. The church which was consecrated in 1558 was in need of extensive repairs. We watched in awe as master artisans worked on the icons above the altar. Scaffolding was everywhere enabling them to reach both the top of the iconostasis and the walls and ceiling. The first thing we noticed was that the iconostasis was not painted white (typical in Slovakia and the churches in the larger cities in Transcarpathia). The color was more of a hunter green with gold leaf used throughout. This same color as well as a robins egg blue is found on iconostasis' in older churches in Transcarpathia. Extensive repairs were done to the church towers and cupolas. A new coat of stain to preserve the wood was applied. The churches in Andreyivka, Mylyk, Polyany and Bil'tsareva are among the elite when it comes to their interiors. They have original polychromes on their walls. Many of the churches in Poland now have a tin sheathing over the wooden roof shingles although, there are still churches one can visit which do not have a tin roof. In the case of Poland, one also sees a change in attitude towards Rusyns and Lemkos by the Latin Rite priests. The priest who serves the parishes of Mylyk and Andreyivka knows all the about the history of his churches. He knows the names of the Lemko families, Lemko religious who are buried in the local cemeteries and everything and anything you want to know about the paintings and even the plascenitsa on the church walls.His two parishes have restored the exteriors of the churches. Both have their octagonal cupolas painted in red, blue and green trim. The painted ornamentation extends as well to other parts of the hipped roof and cupolas. This supposedly was how the early Lemko people decorated these church buildings. The newly restored church in Likitsary - no tin on the roof. Unfortunately, a different situation exists in Transcarpathia. Our people have had a tough life, following the fall of communism. Government funds don't exist for church renovation - especially if it is not Ukrainian. The local villagers in most instances lack the financial means to repair their churches. If a new church is built, unfortunately, they abandon they old wooden church and focus their attention only on the new. The old church now means nothing to them. A prime example is the wooden church in Sokyrnytsia. A new church has been built in back of the old one and that is where the liturgy is now held. Shingles are falling off the old church and no one replaces them. The young priest understands the historical value of the church but his hands are tied because he is not in charge of the parish. What a pity! Our guide and interpreter (a fellow Rusyn) would give the local people heck and tell them that God would punish them for neglecting such an artistic and cultural monument. These villages don't have money to pay for restorations. Several times we were asked if someone would come to the village and just give funds for shingles and oversee the installation of a new roof. Even though they have the people to make the shingles, they must be paid for their time and effort. The church in the village of Ruska Kuchava, is a primary example of how the original architecture and beauty of a building can be destroyed by placing a hideous sheathing on the roof in lieu of the original wooden shingles. The church had its' baroque tower blown off during a storm which was never replaced. Since the village is in an isolated area of Zakarpathia where are the funds going to come from for restoration? The churches in Transcarpathia need help from outside the country. If we don't help our fellow Rusyns, in the future, we may only have photographs of the buildings and nothing else. A photograph just doesn't cut the mustard. One must travel to the lands of the former Sub-Carpathia Ruthenia to visit these architectural marvels of the Rusyn people. Most of these churches have survived from the 1700's; a few are even older. The craftsmanship must be seen to be appreciated. It is their uniqueness which keeps drawing me back to the old country. The Rusyns possess something which no other ethnic group can lay claim to - the wooden church. Our Rusyn ancestors left us a wonderful legacy. It is up to all future generations of Rusyns to oversee their continued existence and survival, for every time we lose a church due to neglect or fire, we lose a part of our heritage. 1. Bozova, John. Wooden Churches in the Vicinity of Bardejov. Bardejov. 1997. 2. 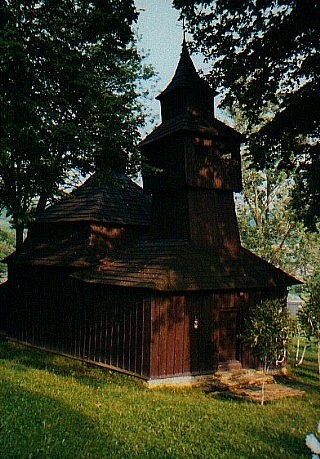 Coleman, Arthur P. The Wooden Churches of Ruthenia. Art and Archaeology. 1933. 3. Iwanusiw, Oleh. Church in Ruins. Hong Kong. 1987. 5. Sirochman, Mikhail. Church of Ukraine Zakarpatthia, L'viv 2000. 6. Sirochman, Mikhail. 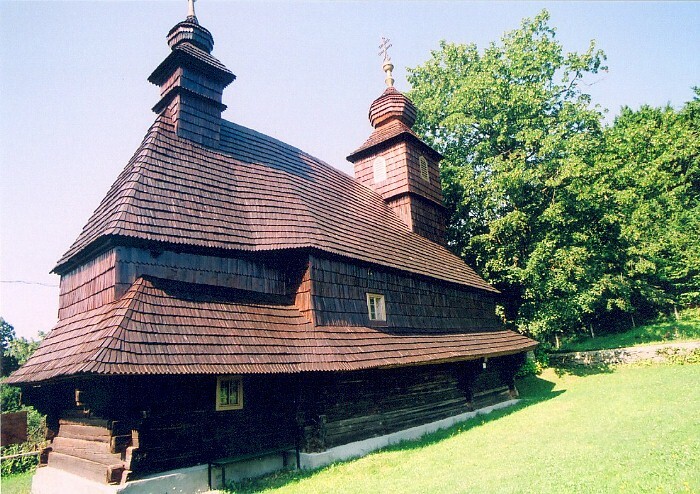 Wooden Churches of Transcarpathia. Pamphlet. Uzhorod. 2002. 7. Sopoliga, Miroslav. Perly l'udovej architektury. Presov. 1996. 8. Zapletal, Florian. Wooden Churches in the Carpathians. Vienna. 1982. 9. Brykowski, Ryszard. Lemkowksa drewniana architektura cerkiewna. Wroclaw. 1986.